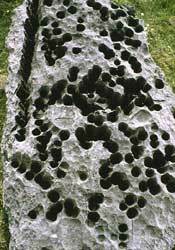 Limestone boulders and crags around the shores of Lough Mask, in Co. Mayo, are riddled with amazingly regular tube-like holes closed off at the top. These have mystified geomorphologists for many years but, after nearly a decade of research, an explanation has now been found. 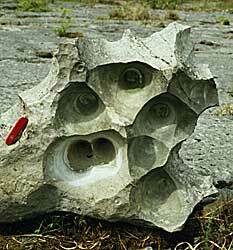 Limestone is a peculiar rock in that it is dissolved slowly by water. This process forms many different types of solutional sculpting, together called karren. Since water moves downwards under gravity, so the limestone is dissolved downwards to form solution pits, solution runnels (like those on the right), the familiar grikes of limestone pavements, and even vast potholes sometimes hundreds of metres deep. 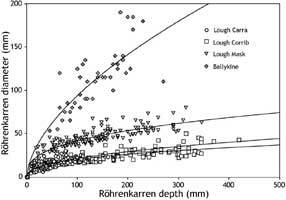 But the peculiar tapering röhrenkarren, or tube-karren, of Lough Mask form from below, with the limestone being dissolved upwards! How can this be? Surely gravity works just the same in Co. Mayo as everywhere else? Something odd must be going on. 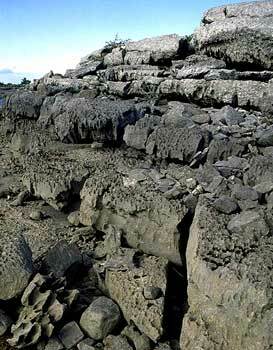 The tube-karren at Lough Mask are found only on the underside of limestone boulders and overhanging ledges in a narrow band a few metres high between low summer levels and high winter levels. 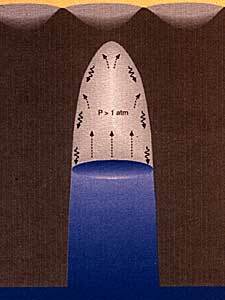 As water levels rise in winter, humid air gets trapped at the top of the tubes. Since it left behind any dissolved minerals when it evaporated, water vapour condensing on the walls of the air-filled tube is more effective at dissolving the limestone than the lake water would be. 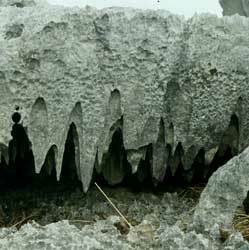 As the condensed water trickles down the walls of the tube it dissolves the limestone. 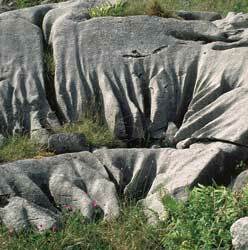 This particular process of dissolving limestone is called condensation corrosion. Tube-karren, or röhrenkarren, have been found around the shores of many lakes including loughs Corrib, Carra, Ennel, Ree and Derg. Bizarrely, each lake has a characteristic size of röhrenkarren. Those around loughs Corrib and Carra are among the smallest, while some at a former higher lake level of Lough Mask are the largest yet seen. It seems that the smallest examples (near right) form in lakes where the water is permanently saturated with limestone and so unable to dissolve the limestone. They form solely by condensation corrosion. In Lough Mask the lake water sometimes becomes mildly acidic and this helps to widen the lower part of the tube. The largest examples, from Ballykine (picture on far right) suggest that the lake water was more acidic at times in the past.